Did Obama screw up and do Trump a favor? A recent act of ‘political payback’ has exposed Obama’s own hypocrisy. Not surprising this latest move has gone unheralded in the national media. President Obama has reversed 60 years of American foreign policy with the immediate ending of the ‘Wet Foot/Dry Foot’ policy. The change, which took effect immediately, brought to a halt the practice that gave Cubans who arrive at U.S. borders without visas automatic entry into the United States — even if they had been smuggled in by human traffickers. Cubans picked up at sea generally have been sent back unless they could establish a “well-founded fear” of political persecution if returned. Not even the death of longtime tyrant Fidel Castro has brought needed relief to the Cuban people. Even now thousands of refugees are paying tens-of-thousands of dollars to fund their flight from the repressive communist Cuban government. Cuban Americans have long voted Republican, though newer generations have tended to shift toward Democrats. 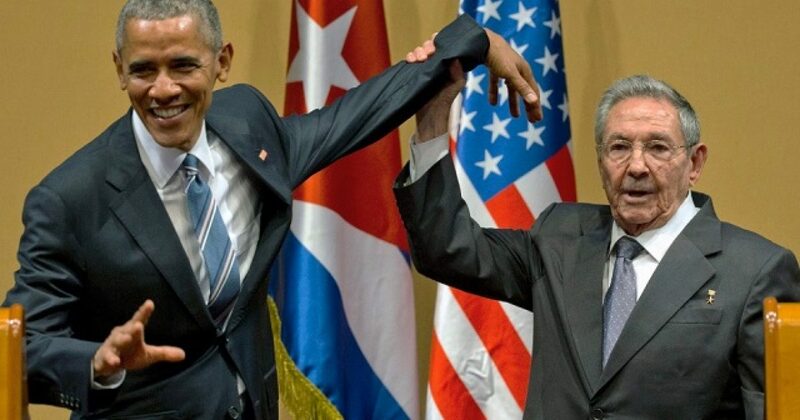 Some polls suggest that Trump is faring well in the group, possibly because President Obama relaxed relations with Cuba, a move opposed by hard-liners in the exile community but more popular among newer arrivals. Trump’s comments about Mexican immigration may not carry quite the same sting for many Cuban Americans, who have long had special immigration status that gives them an easy path to citizenship if they successfully reach the U.S. Looking at all Cubans, including those not registered to vote, only a third (33%) say they identify with or lean toward the Republican Party, according to the 2013 survey of Hispanics. 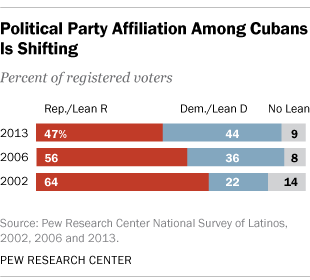 On the other side of the aisle, some 48% of Cubans today say they identify with or lean toward the Democratic Party. The impact of younger Cubans is reflected in those figures. Over half (56%) of Cubans ages 18 to 49 identified with or leaned toward the Democratic Party compared with 39% of those 50 years and older. Among Latinos, those of Cuban origin have had some of the highest voter turnout rates. In 2012, 67% of Cuban Americans voted nationally, compared with 48% of Latinos overall. Believe it or not, the largest number Hispanic-Republican legislators in Congress are of Cuban descent. Senators Marco Rubio, Ted Cruz, former-Senator Mel Martinez, Congresswoman Ileana Ros-Lehtinen, brothers Congressmen Mario Díaz-Balart and Lincoln Díaz-Balart, and current Florida Lieutenant-Governor Carlos López-Cantera. Except for Senator Cruz, all of whom reside and represent Florida in Congress or Tallahassee. The reversal of this policy, much like Elián González did in 2000, has likely crippled Democratic inroads into the Cuban-American community. Furthermore, the move may has cost them Florida in future presidential elections. Yet again Obama appears to have unknowingly hurt the Democrats, ironically in their pursuit of the almighty vote.